There’s been no rest for the Facilities Management team overseeing campus construction projects at SUNY New Paltz this year, even after the completion of the new Science Hall. A $1.5 million plan to renovate and upgrade the Speech-Language and Hearing Center will be complete by the start of the fall semester. The Center’s expanded space in the lower level of the Humanities Building now features a state-of-the-art sound booth, larger therapy areas, modernized facilities, a larger waiting room, and improved access, including a new entrance at the rear of the Humanities Building. 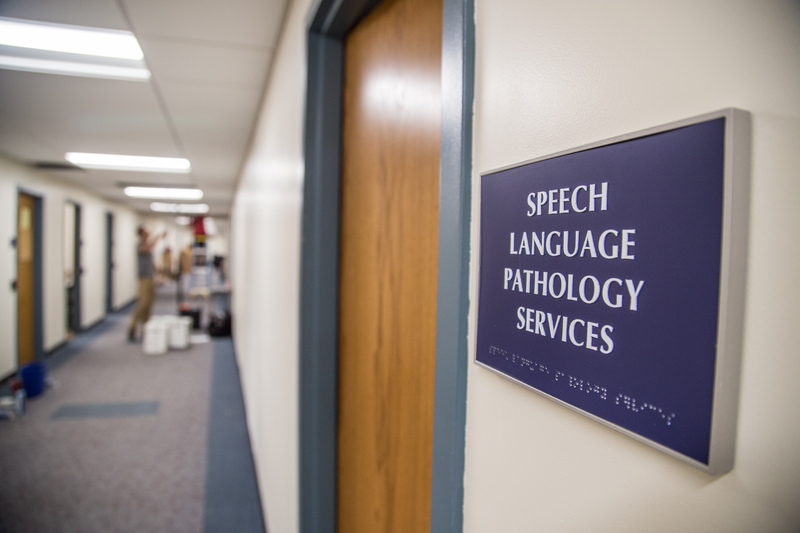 The expansion allows the Center to train more students in the popular Communication Disorders program, serve the local community in new and improved ways, and provide accessibility in compliance with the Americans with Disabilities Act (ADA). Construction will begin this fall on the Engineering Innovation Hub, a project made possible by Governor Andrew Cuomo’s NYSUNY 2020 grant competition, in which SUNY New Paltz was awarded $10 million to help improve economic development in New York State. This project is on track to meet its original estimated completion date of 2019. A groundbreaking will be held in September. The 20,000-square-foot building will be located near the Resnick Engineering Hall, and will help support and diversify the College’s engineering programs, including the new bachelor’s degree program in mechanical engineering, and address a critical shortage in engineers needed to serve advanced manufacturing interests in the Hudson Valley. In addition to providing a home for expanded educational offerings at the College, the facility will house state-of-the-art equipment to support the engineering program and the work of companies partnering with SUNY New Paltz through its 3D printing program. This 217 kilowatt photovoltaic array and battery system, which comes to campus with support from the New York Power Authority (NYPA), New York State Energy Research and Development Authority (NYSERDA), the Electric Power Research Institute (EPRI) and Central Hudson Gas & Electric, is on track to be completed by the end of the year. A ribbon cutting ceremony will be held in October. Installation of the solar array on the roof of Sojourner Truth Library is complete and working exceptionally well. 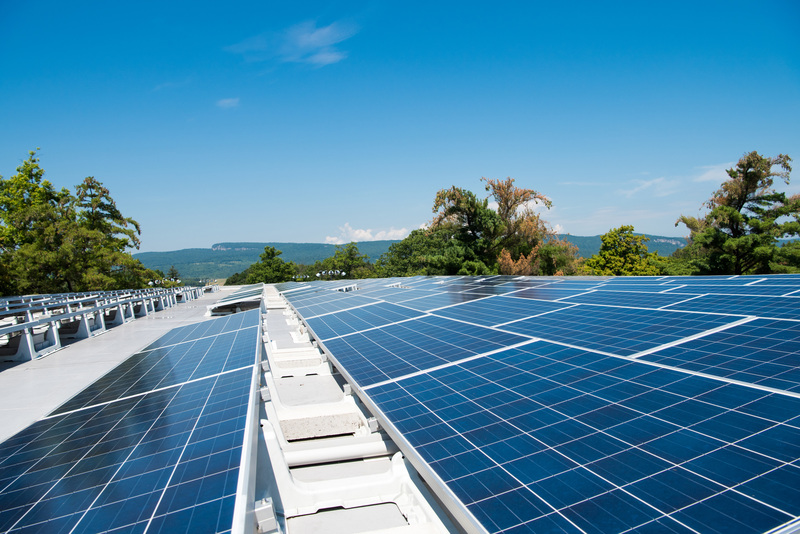 On days when air conditioning is not needed, the library can now operate at zero net energy use – meaning that the rooftop array generates more power than the building consumes. The array on the Elting Gym has also been installed. The lithium ion battery storage system is in progress and on track to be operational this fall. “This is the largest project of this kind on the East Coast of the United States,” Shupe said. It expands both the College’s ability to generate green energy, and its ability to store that energy for use in times of emergency or peak demand, consistent with the College’s sustainability goals and Executive Order 88, which mandates a 20% reduction in energy use by state agencies by 2020. A total gut renovation of Bevier Hall is approaching completion as summer winds down. 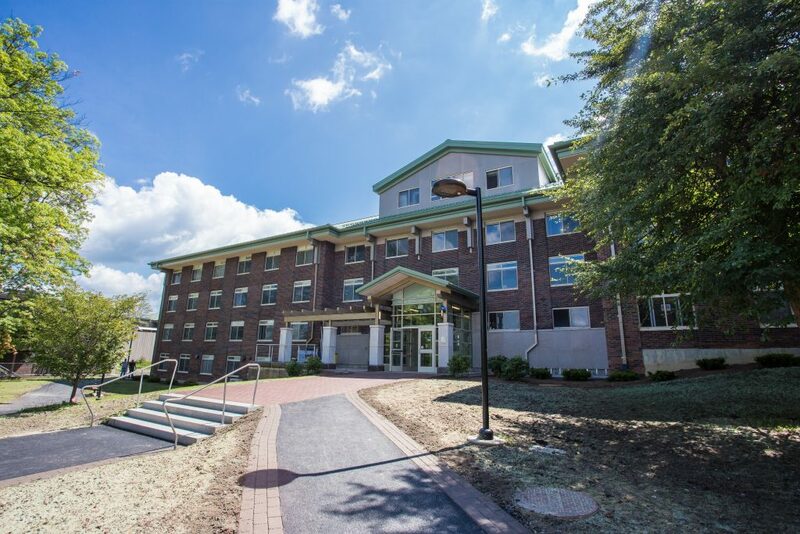 This $19 million project, funded by the Dormitory Authority of the State of New York (DASNY), is the third in a series of major residence hall renovations, each executed over just seven months – a timeline that had been thought impossible, and which New Paltz officials are now presenting at industry conferences and events as a model for peer campuses to follow. 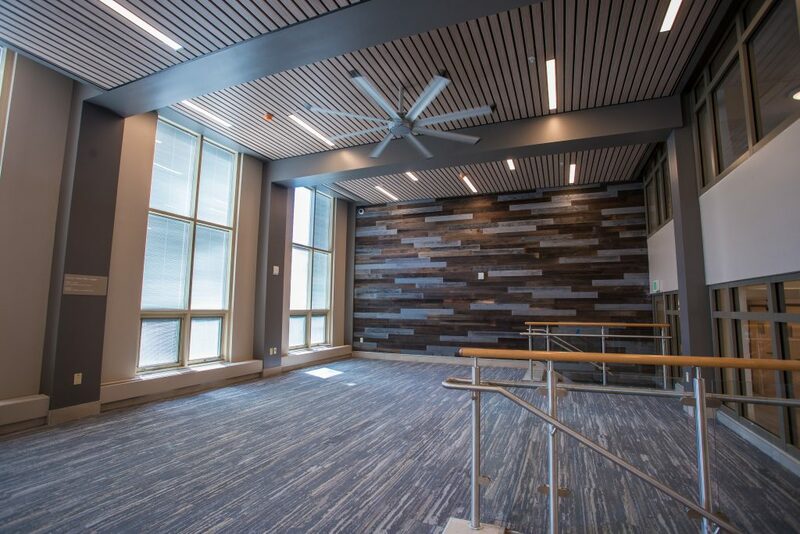 Like Crispell and Lefevre Halls before it, Bevier has been upgraded to ready the building to serve a new generation of students, while also meeting modern efficiency standards. Major construction began in late December 2016, and continued through the summer. The hall will open to student residents for the fall 2017 semester, though they may notice some minor site work ongoing during the first few weeks. Deyo Hall will be the next residence hall renovated using this innovative design and execution model. In other residence hall news, Bouton and Gage Halls received roof replacements this summer. These projects involved new Thermoplastic Polyolefin (TPO) roofing – a reflective white material that is UV and heat resistant, helping the buildings achieve greater energy efficiency. Esopus Hall also had some roof work done, with a renovation to a standing seam metal roof like the one on the new Ridgeview Hall. This will allow for more water resistance and a reduction in humidity throughout the building. Bliss, Capen and Dubois Halls received interior upgrades this summer – mostly new carpeting and paint. A bakery is coming to Hasbrouck! The campus’s main dining hall is getting a $5 million renovation to the lobby and hallway area, complete with a new front entrance, computer lab upgrades, new offices for Campus Auxiliary Services, and a brand new bakery in the retail space (formerly Oscar’s Unplugged). Work on the lobby entrance completed ahead of the fall semester, but construction will be ongoing through the fall as work continues in the area opposite the lobby entrance, where the bakery will open in early 2018. Campus community members may not realize that the plaza deck that enables access to the Haggerty Administration Building and Atrium entrances is actually also a roof, covering the HAB and Student Union Building office spaces below. This summer, that roof got a total renovation, a long-lasting solution designed to eliminate leaking. The deck got a makeover, too, with all-new paving stones installed on top. SUNY New Paltz’s successful and growing EOP program will soon move from the fourth floor of the Haggerty Administration Building to its new home in the Student Union Building, on the ground floor near the Campus Bookstore. Renovations to the EOP’s new home in the SUB (which formerly housed Records and Registration) will begin this fall. EOP provides an array of services to students, and requires comfortable office and collaboration spaces in order to accommodate this work. Completion is projected by the end of the fall 2017 semester. FAB also got a roof replacement this summer, also using the TPO material that supports energy efficiency. The scaffolding around the building is not related to the roof work, however; it is a protective measure against loose brick on the building exterior, which was discovered during routine inspection earlier this year. Facilities Management is still evaluating options for a long-term fix to this situation, so campus community members can expect the scaffolding to remain up through the fall. This ongoing project is nearing completion. Phase one saw new locker rooms added to the Athletic & Wellness Center. Phase two, the renovation of Elting Gymnasium locker rooms, is currently in construction. The new locker rooms are expected to be complete by the end of the fall semester; the College has made accommodations for temporary bathroom trailers to be in use while construction wraps up. A project to construct a new parking lot in the nearly-four-acre lot across Rt. 32 on the east side of campus, recently purchased by the College, is currently in the design phase. In addition to providing campus community members and guests with approximately 270 new parking spaces (which will offset the roughly 100 parking spots lost when the Engineering Innovation Hub project commences), this upgrade will also add crossing signals to the pedestrian crosswalks leading from the lot. The building was completed in early 2017, though the landscaping will take place this fall. Planting has been on hold through the hot summer months, but landscaping should be completed during September, at which point campus staff will be able to remove some of the last fencing surrounding the building. A grant from Central Hudson is providing funding (matched by the College) to upgrade interior lighting in multiple buildings across campus, from fluorescent bulbs to more efficient and longer-lasting LED bulbs. According to Shupe, these bulbs are expected to last about 20 years, as opposed to the roughly two-year lifetime of the fluorescents. They also use less electricity. One of the most historic buildings on campus got a face lift this summer. 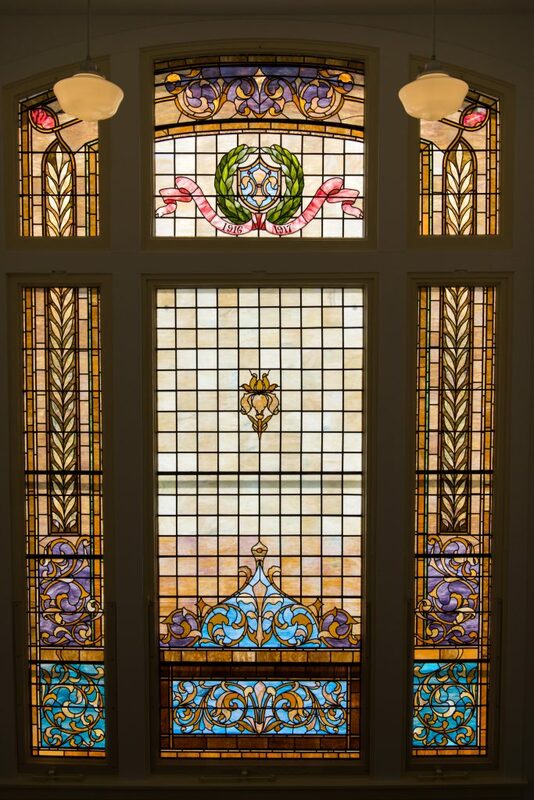 The iconic pane glass window in the front of the building was briefly removed for restoration, and replaced in August. Likewise, the plaque near the top of the building façade, which identifies the building as the “Normal School” (as SUNY New Paltz was once known, some 100 years ago) was also restored to make the words easier to read from below. Two HVAC systems, in Coykendall Science Building and in the Samuel Dorsky Museum of Art, are being replaced. The Dorsky project has been in progress through the summer and should be complete by the end of August, while the CSB replacement is just beginning and will be done by spring.